Consolidation among healthcare providers has continued at a significant rate over the last decade. In 2005, 45% (2,220) of acute, non-federal community hospitals were independent; by 2015, the figure had fallen to 34% (1,677). Factors driving this consolidation have been well articulated and thoroughly examined, and include financial distress, competitive pressures, the challenges of success in a value-based environment, and others. Many of the remaining 1,600-plus independent community hospitals, as well as many small regional hospital systems, continue to contend with those factors, leading them to question if they should remain independent or affiliate. Looking at a hospital’s ability to remain independent raises both political and emotional sensitivities for both the organization’s staff and broader community. A qualitative analysis of the situation will usually generate mixed results. Stakeholder perspectives are likely to range from “seek a partner immediately” to “maintain independence in perpetuity.” The organization’s management and board need clear, unbiased information to inform this important decision. 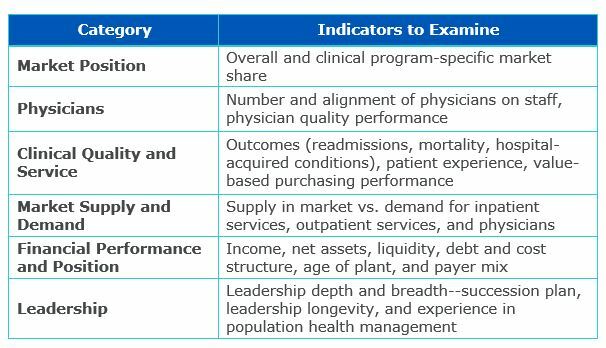 While many quantitative indicators can be used to assess an independent hospital’s current and likely future position, a limited set of important indicators across several key categories—a dashboard—will balance brevity and comprehensibility (particularly for lay board members) with requisite depth. This will allow decision-makers to have a meaningful discussion and ultimately reach consensus on the hospital’s future strategy. It is natural to focus on financial indicators, however, as indicated below, financial performance and position are only one of six major categories. The indicators should be compared to reasonable benchmarks that account for the organization’s size (numbers of beds or revenue) and geography. The results for each indicator should be plotted on a continuum, as below. Indicators can be weighted based on organizational preference. The position of most indicators or of the most highly-weighted indicators on the continuum forms an array that serves as a springboard for discussions on the organization’s overall position. Discussions should result, not in a binary conclusion of “remain independent” or “affiliate,” but rather an indication of urgency. This objective analysis can supplement various perspectives gathered by leadership and serve as a foundation for one of the most important decisions an organization must make in its lifecycle. Sources: 2005 data: Analysis of American Hospital Association Annual Survey data, 2014 for community hospitals; 2015 data: Based on American Hospital Association Hospital Statistics, 2017 edition, Health Forum, an American Hospital Association affiliate, 2017.